If you’ve been keeping up with our reviews, then you already know that Lombok is one of the most diverse islands on the planet. With a total population of 3+ million people, it is home to many customs, traditions, and religions. The Hindu people are one of the tiniest communities on the island; still, they have many landmarks here, mostly thanks to the invasion of the Balinese armies a couple of centuries ago. The Sasak and Hindu are very different from each other. You can see that in the way they build their temples and the way they pray and worship their gods. 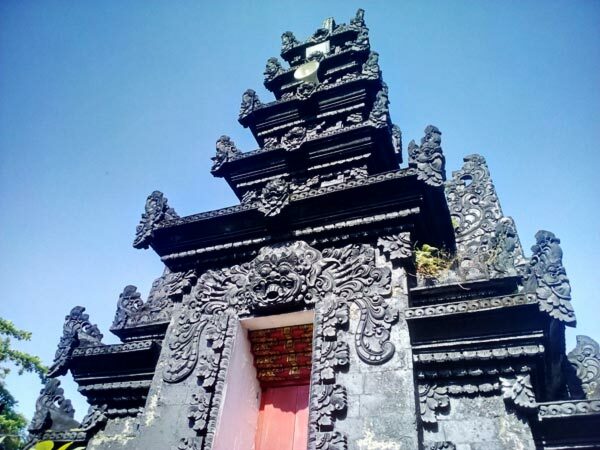 As for the Suranadi Temple, it is one of the most famous tourist spots in Lombok. Now, if you’re all about leaving your problems and responsibilities behind and diving into a completely different world with its own set of rules, then this Pura is exactly what you’re looking for. The nature around here is truly beautiful, nothing like what you’re used to in the concrete jungle. The swimming pool, the delicious and extremely cheap food and the affordable hotel rooms only add to the awesome vibes of the temple. Yes, I recommend this place as one of the finest tourist spots on the island. I spent some time there with my good buddies, and the experience was off-the-charts, as a close friend of mine likes to say. So, we’ve already established that this island is full of ancient temples, and they all have their own history – a background, to be more precise. Most of these landmarks were built during the 18th century, especially the Hindu temples. The beauty of Suranadi is special: it comes with five fountains that flow from the majestic mount Rinjani. It goes without saying that the views there are jaw-droppingly amazing and worth a thousand pictures. The locals believe that these fountains are capable of healing many diseases, which is why it is a very popular place both among the men and the women. The Hindu folks are confident that the Suranadi Temple grants a new life. All they need to do is pray and use the water from these magical fountains. We all are looking for new beginnings, a way to “jump-start” our lives, and who knows – maybe this sacred spot will do that for you? According to the legends, the four fountains appeared on the surface after Dang Hyang Nirlata, a saint missionary all the way from India, hit the ground with his stick. He was a Hindu man and did everything in his power to spread the religion from Bali to Lombok. The Suranadi forest was the first area he entered. Together with his followers, Dang took a rest, not one, but four times. And every single time they did that, the man hit the ground with his stick and “opened up” a new fountain. Every single fountain has its own name, and the locals know them all by heart (at least the elders do). To honor this great leader’s contribution, the Hindu folks of the island hold a special ceremony in his name. Usually, this festival happens between October and November. Keep that in mind and pick a day for your trip that falls between these two months. I’m not saying the celebration is nothing like you’ve ever seen, but it is worth the while. It’s always better to get that full-on experience instead of just visiting a landmark for the heck of it. The Suranadi Temple is not a regular building, that’s for sure. And, at the very least, it deserves respect. Once you enter the territory of the Pura, you’ll discover that it’s divided into 3 separate parts. Utama Mandala is the most sacred place, as the Hindus pray there. Please remember that it’s not open to every single person. That’s especially true for the foreigners. So, find out if they’ll let you there In advance in order to avoid any confusion. The other two parts are NOT used for praying; therefore, you’re more than welcome to “chill” there. If you’ve had enough walking, don’t miss your chance to visit the Bathing Park that’s located in the southern part of the area. The healing water comes from a centuries-old fountain. The experience is fun, believe me! After you’re done with both sightseeing and bathing in the magical fountain, I highly recommend taking a look at the Suranadi Natural Park. It’s full of ancient trees that make the air incredibly “breathable”. I’m not saying the Suranadi Temple wasn’t impressive for me, but this park was simply the best. The joy will be even bigger if you’ve got a loved one on this trip with you. The exotic plants, bushes, and trees will take your breath away. And don’t get me started on the funny monkeys, gorgeous deer and numerous species of birds. Apart from all that, there’s an amazing all-green field +/- 250 meters from the entrance. It’s perfect for building a tent and fooling around with your girlfriend, for example. Or, get together with your friends, have a nice meal, crack open a couple of beers, and share some ridiculous stories. That’s exactly what these places are for! If you go further into this lush forest, you’ll find a dam with crystal-clear water. The whole place can be explored while inside a tiny canoe. It might look funny to you at first, but the experience will be great. Speaking of food, you simply have to try the traditional bulayak sate before you leave the Suranadi Temple. You’ll find folks that sell these in the parking lots. There are many restaurants in the area, by the way, and they’re all affordable. Before entering the area, you should put a scarf around your waist. These can be borrowed for zero dollars. Planning on visiting the aforementioned park? Then don’t forget to grab a mosquito repellent. The bugs in that place are vicious! Plus, there’s a fee upon entering the park. So, do not forget your wallet. When you enter the Bathing Park, they’ll charge you another 10K IDR. It’s best to visit both areas early in the morning (like 9-10 am) because that’s when you’ll have the entire place to yourself. Usually, the tourists don’t visit till 12/13 am; the locals, in turn, aren’t that noisy and mind their own business. The Narmada district is well-developed. The roads are relatively new, and you won’t have a problem driving your car/bike to the Suranadi Temple. Bathe in the fountains, embrace the beautiful nature in the park, and say a word of prayer in the Pura – it’s all up to you. Listen to the birds sing and appreciate the fact that nature is one with humanity in this tiny piece of Heaven. The fountains of Mount Rinjani have been around for much longer than any of us, and the temple is here to stay. Take a moment to realize that. I promise the entire trip will turn into a spiritual adventure once you do that. This fine Pura is just 17 kilometers away from Mataram, the big city (17, 5, to be exact). However, the road is not super-straight; so, it will take you 35-45 minutes to get there in a rented car and/or motorcycle. Or, hire a private taxi driver – I bet he’ll take you there 5-10 minutes earlier. Public transportation is the least favorable option, as it’s slow and no fun at all. As a general rule, public buses and ferries only leave when they’re full. In my opinion, renting is the best option, especially if you’re on the island for 5-7 days and want to see more than one landmark. What can be better than driving around on a fancy motorcycle and doing some sightseeing? Sure thing, you’ll save some bucks if you go with a public transport, but all the frustration and confusion isn’t really worth it. Renting is super cheap in Lombok, especially for the people from the EU and the US. Same is true for the food and hotel rooms (we talked about it earlier). In the Suranadi area, you’ll find a gym, a supermarket, several other temples, and many delicious cafes/restaurants. Take a look at the map below to get a complete picture of the activities that are waiting for you once you exit the Suranadi Temple. Bathing in the fountains is the most enjoyable thing I've ever done! Pity they don't allow you to take some champagne with you. We arrived at the temple in a taxi. The ride took exactly 39 minutes. Pura Suranadi is right in the middle of a well-developed area with eating spots and places to have fun and rest. Ancient Temples are the selling point of Lombok. I've seen one too many; nothing out of the ordinary about this one. Unless you're into all those legends and fairytales about old men creating fountains with their sticks. The Park is lovely. We had a great time "camping" there for hours. Once you enter the forest, it feels like you end up in a different dimension. Everything in this place feels right. I had a great time visiting the temple and would love to come back sometime in the future.